Evandro intends to become businessman, but it is not long before he turns into a gangster, and builds up a huge empire out of his organization of crime. A Brazilian Gangster show set in the 1990's. Where can you stream Impuros? 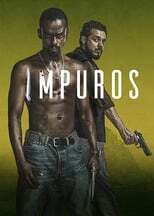 On 2018-10-20 Crime/Drama TV Series Impuros first aired on Fox Brasil. Written and created by Alexandre Fraga, and produced by Barry Company & Fox Network, Impuros will return and was last broadcasted on 2018-12-21.